Allergan, Inc. is a multi-specialty health care company established more than 60 years ago with a commitment to uncover the best of science and develop and deliver innovative and meaningful treatments to help people reach their life’s potential. Today, we have approximately 10,000 highly dedicated and talented employees, global marketing and sales capabilities with a presence in more than 100 countries, a rich and ever-evolving portfolio of pharmaceuticals, biologics, medical devices and over-the-counter consumer products, and state-of-the-art resources in R&D, manufacturing and safety surveillance that help millions of patients see more clearly, move more freely and express themselves more fully. From our beginnings as an eye care company to our focus today on several medical specialties, including eye care, neurosciences, medical aesthetics, medical dermatology, breast aesthetics, obesity intervention and urologics, Allergan is proud to celebrate more than 60 years of medical advances and proud to support the patients and physicians who rely on our products and the employees and communities in which we live and work. 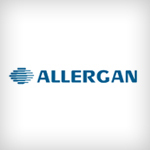 In January 2012, Allergan announced a €350m expansion at their Westport which will significantly expand manufacturing and product development capability across all of their product franchises.